HEADIN' DOWNTOWN: Melbourne songstress Melissa Langton debuts her tribute to Petula Clark in Geelong this month. Melissa Langton’s fascination with pop legend Petula Clark began as a child watching the classic 1969 film Goodbye Mr Chips. “It was my all-time favourite movie as a kid,” she told the Indy on Monday. The fascination has continued through decades of touring internationally with tribute act The Fabulous Singlettes. “We do quite a number of her songs – everybody knows who she is,” she said. But Downtown will be Langton’s first show dedicated to solely to the pop icon when it debuts at Geelong Performing Arts Centre (GPAC) this month. “Her style is quite happy and chirpy – what I love about her is she was so much fun,” she said during break from rehearsals. Stories of Clark’s childhood have inspired Langton. She and fellow entertainment legend Julie Andrews started their careers travelling on trains together with troops around England to sing in wartime gigs. “They used to sleep up in the luggage racks on the train,” Langton said. As a young woman Clark sounded “like Doris Day” at first but soon “created her own style in an industry dominated in by men,“ she said. Clark would go on to record classics like Don’t Sleep in the Subway, This is My Song and Downtown. She topped the charts during the height of Beatlemania and starred onscreen and onstage. Downtown featured songs from both Clark’s acting and musical careers, Langton said. Ironically, Clark played Maria von Trapp in a 1980s West End production, after her childhood friend made the character famous – a fact not lost on Langton. “We’re going to do a bit of Sound of Music,” she said. 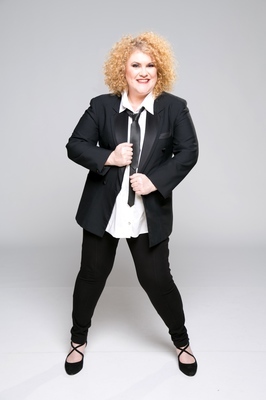 Langton herself has had a prolific career in music and on stage, acting in Australian remakes of Jesus Christ Superstar, Les Miserables, The Pirates of Penzance and more. She has performed cabaret originals and tribute gigs from New York to Auckland. “The highlight of my job, in general, is I get to travel,” she said. But nothing matched performing in Germany, especially in local Speigeltents, Langton said. “We (The Fabulous Singlettes) do a Germany tour every year. Langton said Downtown would be her first GPAC gig. She will perform with a three piece band, including husband Mark Jones, on 13 June before returning the next day for another show. “The band makes it way better I reckon,” she said.